I’d like to thank the cauliflower gods for this one because never in my wildest dreams could I have imagined what I’m about to share with you. 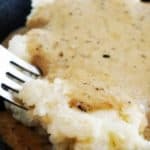 I have created the smoothest creamy cauliflower mash out there and it come’s with a side of keto gravy! Over the past few months I’ve had to correct Matthews lumpy cauliflower mash dozens of times, so trust me, I know what makes the difference between mediocre and perfection. The process of creating this delicious side dish is similar to mashed potatoes, but without the hard parts! You’ll simply throw the cauliflower into a processor after boiling and blend until silky smooth! It’ll be the easiest dish to make this year and the biggest hit at the Thanksgiving table! What Sets This Cauliflower Mash Apart? Nutrition: Let’s get right down to business. The macronutrient we all focus on most as keto-ers is carbs, specifically net carbs. Net carbs is the overall carbs minus the fiber. One cup of cauliflower has 6 net carbs while one cup of potatoes has 22 net carbs. Astonishing, I know. If you opted for the potatoes you’d be over the standard ’20g of carbs or below’ daily intake. So nutritionally, cauliflower mash is your best bet! Mouth Feel: The cauliflower mash is not only creamier, but absorbs and blends the flavors of each individual ingredient perfectly. You get hints of rosemary, garlic and parmesan with each bite you take and the lightness in weight prevents the dreaded heaviness in your belly you would normally get with potatoes. When it comes to mashed potatoes the starchiness of them makes it harder to get a perfectly distributed flavor. After a lot more salt, however, the potatoes come to life. But, while satisfying your tastebuds they wreck havoc on your abs! We have also made a keto gravy to pour on top of the mash. It’s one of our simplest and quickest recipes to make, and tastes just as great atop a slab of turkey. You are not going to want to celebrate Thanksgiving this year without this gravy at the dinner table! Looking for more holiday keto action? Check out our Pecan Pie and Green Bean Casserole Recipes! Chop up 5 cups of raw cauliflower. Bring pot of water to a boil (enough to cover all the cauliflower), add the cauliflower and boil for 15 minutes or until tender. Drain cauliflower and place in processor. Cook butter, garlic and rosemary in a saucepan over medium heat until fragrant. Add melted butter, garlic and rosemary to processor and pulse several times until well combined. Add cream, parmesan, salt and pepper to processor and process until smooth and creamy. Taste for salt level. Serve warm and enjoy! Combine cream, butter, broth/drippings in a sauce pan over medium high heat. Bring to boil and then reduce to simmer for 10-15 minutes. Add xanthum gum and pepper. Stir until gravy thickens and reduces down to consistency of your liking. Enjoy!